What it’s about: Since the beginning of time, many of humanity’s accomplishments—classic songs, the moon landing, the Great Wall—were created out of spite. Naturally, our most important emotion has had an effect on architecture. Through the years, spite has motivated the construction of many a domicile. The Richardson Spite House in New York, constructed in 1882 and torn down in 1915, was 104 feet wide and only 5 feet deep, and served as an apartment building. The owner couldn’t get what he thought was a fair price for the land, so he decided to make use of it. The building had eight apartments, which were cramped even by New York standards. Biggest controversy: Family grudges last a long time. 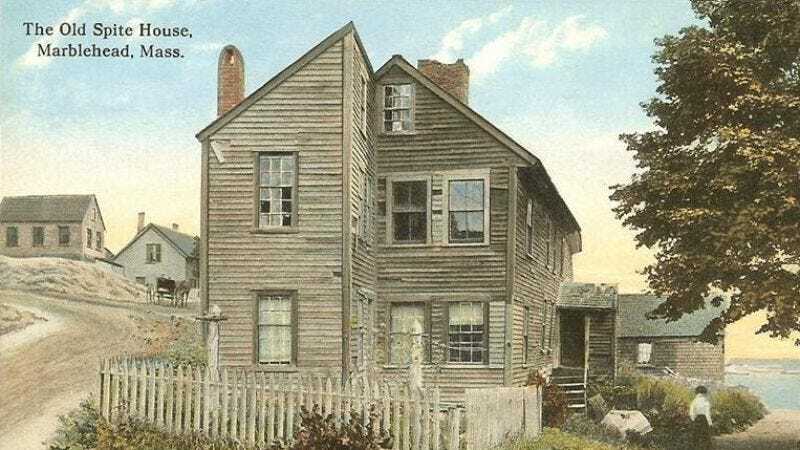 Perhaps the oldest still-standing spite house in America is the Old Spite House in Marblehead, Massachusetts, built in 1716. It has the appearance of a ramshackle duplex because two brothers had to split a parcel of land (another inheritance, this time fifty-fifty), and one built a house flush up against the other. As the story goes, the two weren’t on speaking terms, and neither was willing to sell his half to the other. Thing we were happiest to learn: Sometimes spite can lead to architectural greatness. In the 1930s, Corina Kavanagh, a wealthy Irish woman living in Buenos Aires, attempted to arrange a union with a young man from the wealthy, aristocratic Anchorena family (this page says she wanted her daughter to marry the man; her spite building’s page says she was to be the bride). The Anchorenas refused, and as revenge, Kavanagh built a skyscraper between the family’s mansion (now the Ministry Of Foreign Relations) and the church the Anchorenas had built nearby. The Kavanagh Building is still a local landmark, and at the time of construction was the tallest building in Latin America. Best link to elsewhere on Wikipedia: Spite’s best-known expression is “cutting off one’s nose to spite one’s face,” a phrase so useful and common it has its own Wikipedia page. Shockingly, Wikipedia suggests this may have been a real practice, as women in extreme circumstances would disfigure themselves to protect themselves from sexual assault. The page gives the example of Saint Ebba, a nun in 867, who, when facing a Viking raid, encouraged her nuns to cut off their noses and upper lips to avoid being raped. It worked, in a sense, as the Vikings were suitably disgusted, but so much so that they burned down the abbey with the nuns inside. Further down the Wormhole: Based on the page’s citations, spite houses are a recurring subject for The New York Times, which has covered several on the list. The “failing” paper of record has won more Pulitzer Prizes than any other and has the largest circulation of any city newspaper in the country. A high-water mark in the Times’ history was the publication of the Pentagon Papers in 1971, previously secret Defense Department documents that implicated both Presidents Johnson and Nixon, as well as National Security Advisor Henry Kissinger, in expanding the Vietnam War into neighboring countries. Kissinger is one of the most divisive figures of the era, even taking into account it’s an era in which a president was nearly impeached. Dr. Kissinger is considered a war criminal by some, but was awarded a Nobel Peace Prize. He is an honorary knight and the first honorary Harlem Globetrotter. Kissinger has also written political commentary for Chicago-based Tribune Media, giving him an unlikely colleague, Bozo The Clown. Tribune also created the most successful locally produced kids’ show of all time, WGN’s The Bozo Show. As The A.V. Club celebrates Chicago Week next week, we’ll check in on those clowns that amuse children on television. What a bunch of clowns.